I took this photo at Universal Studios Hollywood. 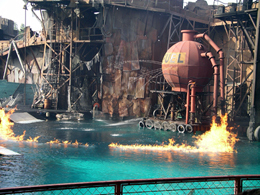 It is at the water world show. I feel this fits the irony challenge. Fire on Water. Thank you for taking the time to vote on this. Nice color in the water. A little too snap shotty for me. Looks like an interesting shot...hard to see any detail because it is so small. Good colors, I like the flames. REALLY wish this was bigger. Too small, have to really strain to see the picture but then again I'm old, LOL! Guessing this was taken on one of the studio tours. Proudly hosted by Sargasso Networks. Current Server Time: 04/22/2019 11:58:32 AM EDT.